The Days Ahead: US inflation. Watch for German and China trade. One Minute Summary: Markets were slow. Many traders and investors were off for the week. Europe was all but closed. The trade and political stuff makes for big jumps in volatility. This is good for bank trading desks and option writers. For long-term investors it’s not a problem unless they react to it. As we’ve mentioned before, this volatility feels unsettling because it’s been quiet for much of 2017. In fact, volatility is bang in line with its long-term average. Welcome back my friend, to the show that never ends. U.S. Treasuries were up. Bond spreads ticked up. That's the credit worries at work. The S&P 500 was down 1.2% for the week. It’s down 2.5% so far this year but up 11% on the year. Small caps have done comparatively well this year. Tech was down again. It’s mostly fear of regulation because we don't expect earnings to be hit soon. We would still buy the protection we put in place for clients recently. Europe and Emerging Markets were positive and have outperformed the U.S. by around 2% this year. Japanese exporters had a tough week. They're in the trade crossfire. Last year, Prime Minister Shinzo Abe gave President Trump a hat with a logo reading “Donald & Shinzo, Make Alliance Even Greater.” He may ask for it back. 1. What a mess with China: You may have noticed there was some chat on trade with China last week. Some 99.99% of economists believe trade wars hurt the world economy. The others don't. We found it useful to try and unpack some of the talk, ‘cos , you know, you might think we have a $500bn trade deficit with China. (Skip to the end if numbers are not your thing). 3. The trade deficit is thus $337bn. Still large but not $500bn. 4. Most of what the U.S. sells to China is food, aircraft, cars and capital goods. They're 52% of all exports. 5. Most of what China sells the U.S. is cell phones (some $65bn a year), computers and telecomm equipment and toys. 6. The U.S. has 25 products that account for more than $1bn in sales to China. China has 68 coming the other way. Now it would seem that China is in a very good position here. The U.S. has targeted 25% tariffs on some $50bn of goods coming in from China. So that's $12.5bn. Here’s the full list, starting with Thorium. They left off the cell phones because because that “Designed in California, assembled in China” on the back of your iPhone means exactly that. Apple and others would have a fit if those were part of the deal. China, of course, retaliated last time on the steel tariffs with 25% tariffs on $3bn of stuff from the U.S. That's the wine, ginseng and pork products one. So, that’s $750m. This time, they've targeted the big ones like soybeans, aircraft and cars. They floated a tariff rate of 25%, which would cost U.S. exporters around $22bn. Put this all together and we’re looking at around $45bn of cost for U.S. exporters and U.S. consumers. That’s around 0.2% on a $20 trillion economy. If the U.S. goes with the $100bn increase we heard about last night, then add another $25bn for a total of 0.3% of GDP. But this is not the point. What worries businesses is how far this can go, whether supply chains will have to be redesigned or business strategies rethought. So Boeing, John Deere and Caterpillar were all down around 12% recently. The stock market reaction, down some $1.5 trillion since February, is way out of proportion. But then it nearly always is. The foreign exchange market, however, is not rattled. If markets get really scared about this, expect the dollar to strengthen and the Yen and Renminbi to weaken. It’s been the opposite. 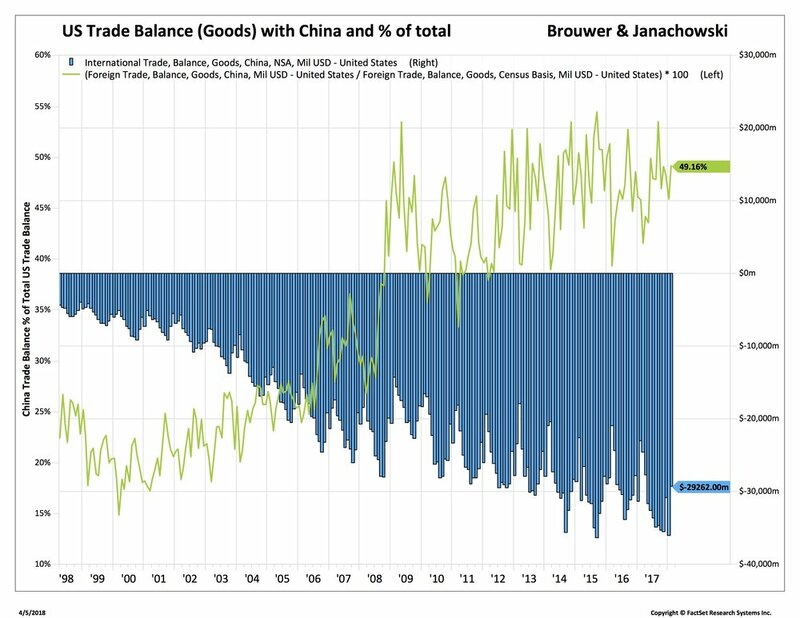 Anyway, here's the trade deficit with China. It’s 50% of the U.S.’ entire trade deficit. If I were a betting man, I’d say the U.S. will have a tough time winning this one. 2. How about those jobs numbers? Meh, not so good. It was just 103,000 compared to 326,000 in February. We have a kind of love-hate relationship with the jobs numbers. On the one hand, they're a big, market-moving event. The Fed follows them because it’s part of their mandate. And you’ll occasionally hear an administration mention them. But they're subject to huge variations from initial to final, have weird seasonals and tend to over or under report against consensus by 50,000. Yes, a 100,000 estimate produces a 50,000 to 150,000 result. And that's considered fine. Anyway, here they are with the bottom line showing average wage increases. That’s the number that got everyone worked up two months ago when it spiked. We thought then it was a seasonal thing and it certainly looks that way now. 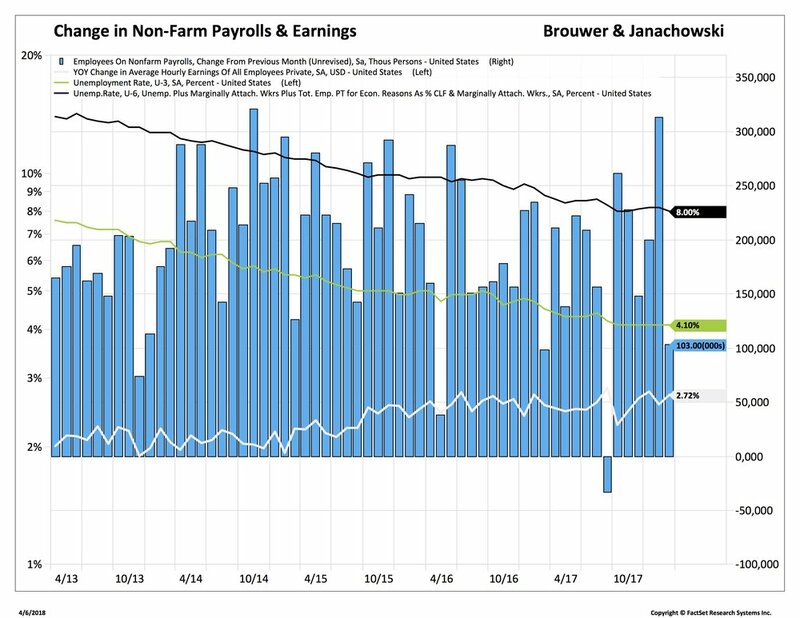 Average earnings were up 2.7% but these are nominal not real increases and skewed to supervisory workers. The non-supervisory workers saw a much smaller increase and lower weekly earnings. Which means they had a modest pay rise but got to work less. The market had other things on its mind and gave the numbers a big yawn. It was mildly bullish for Treasuries with rates at 2.78%. It all supports our low growth low inflation outlook. Bottom Line: Expect markets to react a lot to bellicose trade talk. Mr. Zuckerberg will visit Congress. Probably best to stay clear of big tech for a while. The Days Ahead: Shorter trading week and Europe will be very quiet. Asian markets on watch after the trade news. One Minute Summary: Trade issues hung over stocks again. The Fed was generally hawkish and clearly thinks “gradual” increases are on the way. So, another two this year and maybe three. Tech came under tremendous pressure. The sector was down 8% with Facebook down 14%. It’s now the cheapest it’s been since the IPO. Financials had a bad week too. Normally, they do just fine as rates increase. This time there seems to be a funding problem and overnight rates climbed sharply. This might be a result of changes to how banks fund themselves post tax reform. We're now in a higher volatility era for equities. So far this year average volatility has been 17 and it closed at 23 on Friday. It's long term average is 18. In 2017 it was 11. That’s clearly the outlier. Our list of things to worry about now includes tech, trade and earnings in addition to the normal phase of the cycle, U.S. politics and rates. European and Asian markets performed better than the U.S. Emerging Markets held up well despite the trade issues. The dollar weakened again. It’s down about 3% this year. 1. Meet the New Fed. The Fed met for the second of its eight meetings this year and the first with Fed chair Powell leading. The Fed holds a press conference in four of those meetings, which tend to fall two weeks before the quarter end. One feature the Fed has developed in the post-crisis era is that it has given very clear forward guidance on its thinking. The idea being that markets could afford few surprises. So, it was no news that they announced a 25bp increase in the Fed Funds Rate range to 1.50%-1.75% from 1.25%-1.50%. But what the market was hanging on to was the “dot plots” and economic projections. And answers to the big questions: does the Fed see the economy growing, is there inflation and will there be more rate increases? Well, the short answers are “a bit”, “not really” and “possibly”. Here's the most important graph, the dot plot, which shows where the FOMC thinks rates should be in coming years. 1. The wide dispersion of views. In just a few months, the range for rates in 2019 jumped from 1.2% to 3.5% to 1.5% to 3.8%. There was an even broader dispersion for 2020. Clearly the board thinks the tax cuts and stimulus are going to work and will need correcting. 2. The Longer Run. The Fed sees the cycle peaking in the next two years and sees the long term Fed Funds Rate at near 3%. This seems wishful thinking to us. The economy would have to show a growth or inflation spurt that’s been absent for a year. There is a dot for each member of the FOMC and the regional Governors. But one declined to vote and there are four Fed Board Governors still to be confirmed. And, to us, that's important. This Fed is woefully understaffed right now and new members could easily change the Fed’s outlook and hawkishness. The takeaway is that this is benign for the markets and we saw 10-Year Treasuries rally after the meeting. We don't see this Fed as wanting to raise rates dramatically and so hold to our view that rates will stay in the 2.75% to 3.00% range for a while. 2. More on Trade: The latest round of trade tariffs hung over the market. While we’re not sanguine about the whole trade war talk, the latest news on the steel tariffs is better. Remember just two weeks ago? It was a full on/bring it on global 25% tariff on all steel. Now, there are reprieves and exemptions on six of the ten top steel importing counties, and 28 members of the EU. That’s 56% of the total imports or around $5.2bn of additional annual costs. Of course, that’s now. It will change. The U.S. exports around $185bn of goods and services to China. It imports round $523bn. That blue bar is the monthly deficit in goods and that’s what the Administration has in its sights. It's around $35bn a month and was $375bn in 2017. Again, there was some pretty fierce talk about the theft of American prosperity and they targeted around $50bn of that $375bn. It’s not the whole amount. It’s tariffs of 25% on about $50bn, so $12.5bn of costs. Still, China came out swinging and will probably target Republican sensitive districts. They've already started with food products, wine and some steel but those were in retaliation for the steel tariffs, not the latest ones. No wonder the likes of Apple, Microsoft, Starbucks, GM and Nike are in the firing line and will probably remain so. If we just do the math, the two announcement amount to around $19bn. That’s 0.1% of GDP. But the fall in stocks has been more like $1 trillion. Bottom Line: Short week. We're looking at how Asian markets react to the escalation in the trade tariffs. As clients know, we’re placing some protection U.S. stocks right now as we expect volatility to remain high.